Plants are easy to overlook. Plants are inanimate (mostly) and often become more of a background or a food item than a dynamic, living, breathing aspect to our world. It’s easy to forget the casual, everyday miracle that plants can take dirt, sunlight and water and turn it into delicious food, building an ecosystem from the bottom up. Beyond the everyday characteristics of plants that we so take for granted, they are firmly rooted (pun intended) in mythology, religion and spirituality. In a word, many plants are sacred. Trees cover the gamut from sacred to almost evil depending on your perspective. The story of Cain and Abel, as well as their parents of Adam and Eve show interesting insights into the early Israelite relationship to the earth. Of course, the knowledge of good and evil are imparted to Eve and then to Adam from the fruit of a tree. The curious revelations from the fruit lead to Adam and Eve’s expulsion from Eden and a life of toil. The curious thing is that later, Cain a man growing fruit seems to be rejected or at least ignored by the God of the Bible, while Abel, a herdsman is embraced. To some the story of original sin as well as Cain and Abel is a veiled tale of a people torn between a sedentary life of agriculture and a pastoral, free roaming, nomadic lifestyle. In this way, a life of tree planting is seen as a life of hardship and toil, out of balance with a more natural life of gathering or perhaps pastoralism. In this light, fruit trees are cast as a sort of villain, a harsh master demanding so much work for the mixed blessing of their fruit. Trees continue to be villainized throughout the Bible. In Exodus, Deuteronomy and Kings, you see the God of the Bible connecting groves of trees to pagan worship and even commanding Jews to burn pagan groves. To me, this hints that Judaism may have itself risen from an early polytheistic religion that included tree planting. The mention of sacred groves certainly says that other religions in the Biblical Middle East connected trees to their deities. In many other parts of the world there are other religions with their own sacred trees. There are groves of trees sacred to Hindus in India where hunting and other activities have traditionally been strictly regulated. There are also a few Indian Islamic and Buddhist groves. 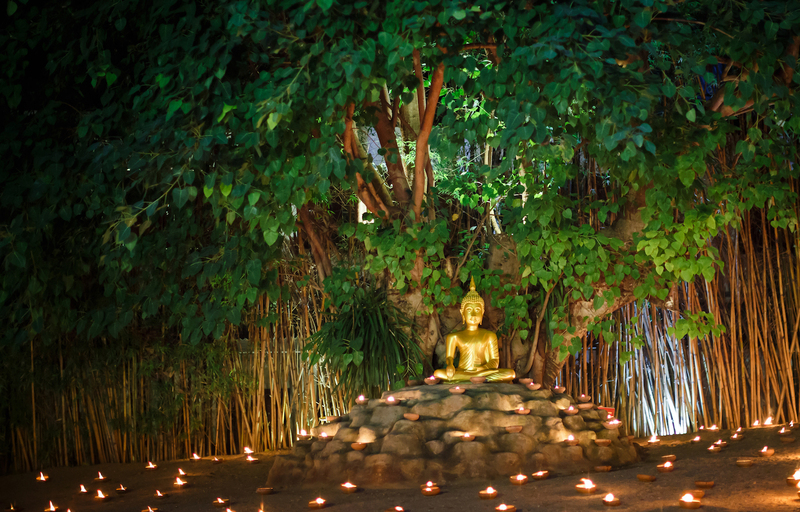 It’s said that the Buddha himself reached enlightenment meditating beneath a Bodhi Tree (Ficus religosa). Japan has groves associated with Shinto shrines and the Celts throughout Europe had groves, usually associated with the Druid goddess Nemetona. In Norse mythology, the tree Yggdrasil is an enormous ash that connects the nine worlds from the roots of the dark underworld to the airy heavens together. Parker is talking about using Peyote in the American Indian Church. Peyote is just one of many mind bending, plants imbued with spiritual powers. There is even talk that psychedelic plants were instrumental in creating even the most popular of modern religions. Looking again at the Bible story of Adam and Eve, one wonders if there is another interpretation to be made. Perhaps the tree of the knowledge of good and evil is a psychedelic plant giving revelation from a powerful wallop of drug. Ayahuasca is another drug, derived from vines and other plants that is becoming more popular. The drink is a powerful hallucinogen from the Amazon region and extremely important in Native South American culture. These days tourists visit retreats to take Ayahuasca as a sort of short cut to ‘instant Karma’ or enlightenment. There are hints that the ancient Greeks may have mixed hallucinogenic plants into their wine on special occasions. Of course our most common mood altering drugs also come from plants in their own way, alcoholic beverages although created by yeast are created from plants. Plants provide medicine as well as enlightenment. Many modern drugs are derived from plants. Heart medicine is made from the poisonous flowering plant foxglove; aspirin was originally discovered in tree bark. Quinine, a drug used for malaria was discovered in the bark of the Cinchona tree of South America, despite that malaria originated in Africa. With all the uses of plants and our dependence on them, it’s hard to say they aren’t sacred. If you consider your own life special, sacred, valuable, consider this: your life depends on plants for almost everything.